Browse through the profiles of equipment we have built in the past. The profiles are organized by equipment type to make finding relevant information quick and easy. The Magnetic Tape Applicator is a machine designed to apply magnetic tape from a roll onto a sheet of paper. The sheets are stacked by the operator and then automatically shingle fed through where the magnetic tape is then applied to the sheet based on preset margin positions. After the tape has been applied, the sheet is then automatically restacked in a paper tray for the operator. 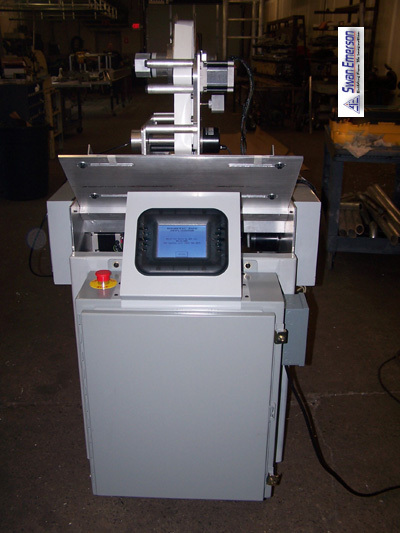 A PLC and touch screen combine to control all aspects of the Magnetic Tape Applicator. The touch screen has a simple user interface requiring minimal training. It also allows the operator to control the feed speed and margins used for applying the tape to the sheet. The Magnetic Tape Applicator increased production efficiency from 400 sheets per hour manually to over 1200 sheets per hour automatically. 2004 © Swan Emerson incorporated. All rights reserved.